A goal is a term in digital analytics that stands for something to be achieved. Some of the most popular goals for e-commerce websites include a purchase, newsletter subscription, and new user sign-up. In most cases, a goal stands for something that is good for the business but doesn’t necessarily have to be so. For example, you might track refunds as goals, too. A successful completion of a goal is generally referred to as a conversion. Therefore, conversion rate (of the major goal) is one of the most important metrics for a website. Depending on a platform you are using, a goal can have multiple possible definitions or criteriums, most common one being visiting a specific page (i.e. thank you page), followed by custom events and duration (i.e. users who spent more than 10 minutes on your site). 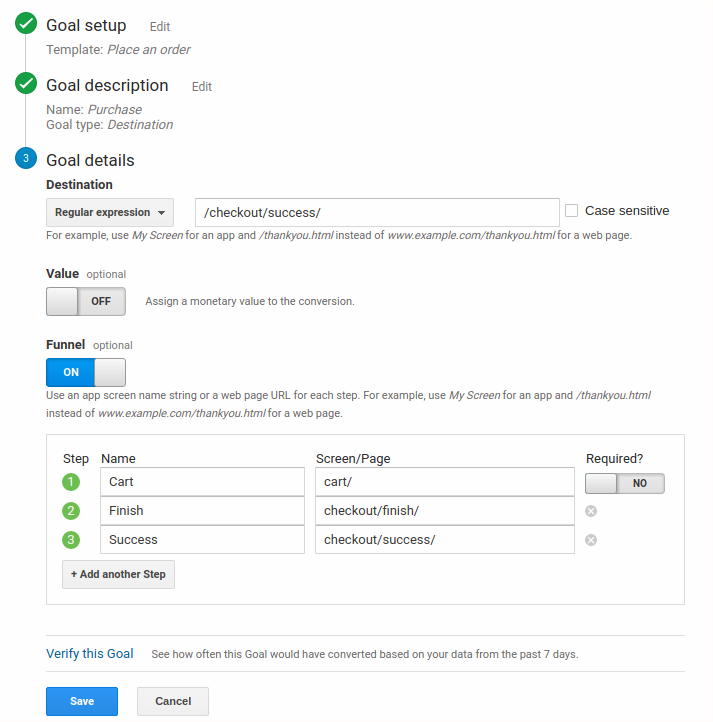 Here’s an example of a goal set up in Google Analytics.